To make sure Noah and I get the necessary vitamins and nutrients, I decided to give green juice a try. My mom has been juicing for years. Every morning, before having a cup of coffee, she prepares a fresh juice, and every time we visit she forces one of her colorful concoctions on Eric and I. Almost a year ago (before the pregnant days), I watched a great documentary – Fat, Sick and Nearly Dead. Back then I was more focused on a plant-based vegetarian diet. I was also not a big fan of juice. I blame popular diet methodologies for classifying juice as a high calorie food and instead promoting fresh fruits and vegetables for the same nutritional benefits plus an added bonus of fiber. And they are right (to a certain degree). But I would never sit down and eat three plain stalks of celery and a cup of kale for fun! Even I, who loves all vegetables, have my limits. This is where juicing comes in, as I can consume large quantities of good-for-me veggies by mixing healthy superfoods with sweet fruit to indulge my taste buds. 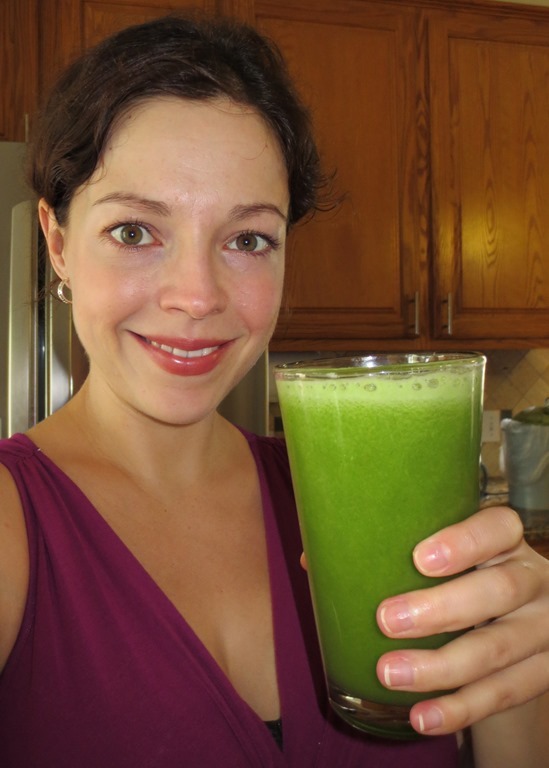 As with any long term change, you have to embrace juicing on your own terms. It’s pricey (especially if you opt for organic produce) and time consuming for prep and cleanup. 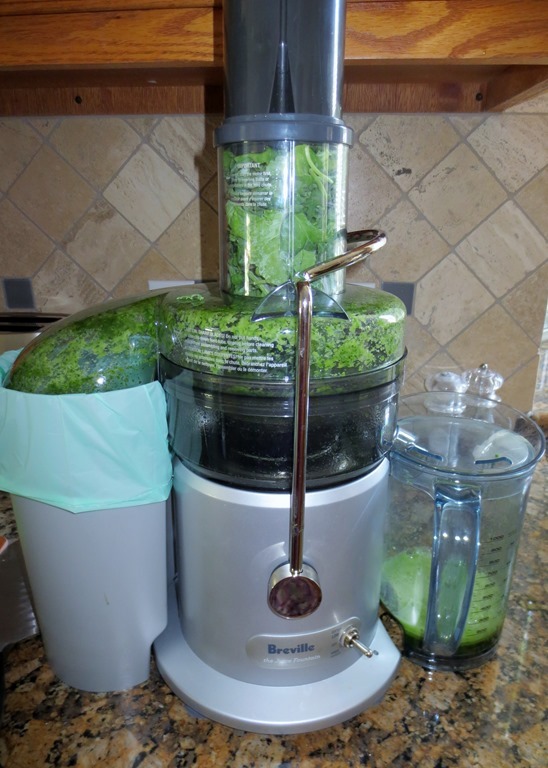 To re-enforce my commitment to juicing I decided to splurge on a good juicer so I turned to Joe Cross to find out which juicer he was using during his hundred day long juice fast. Turns out, it’s the same one my mom has (go figure!) Breville JE98XL. When I showed up at Bed Bath and Beyond, there was even a promotion of a free Joe Cross movie with any Breville Juicer purchase. When it’s meant to be, it’s meant to be! To save money, I like to stock up on ingredients at Costco. A pre-washed 1.5lb bag of organic Kale is only $4.99. Three large English cucumbers are $3.39. I get 10lbs of red delicious apples for $8.99 and the biggest, ripest pineapple for under $3. 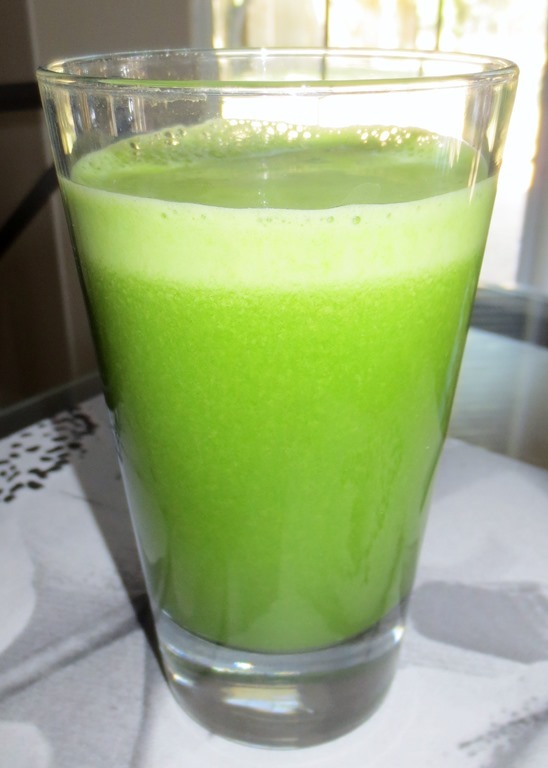 I adopted my green juice recipe from Joe Cross with slight modification from Ashley. I had to experiment with quantities a bit and here is what I came up with. The order you run the ingredients through the juicer matters. I learned this first-hand after bits of lemon flew out of the juicer and onto the cabinets. 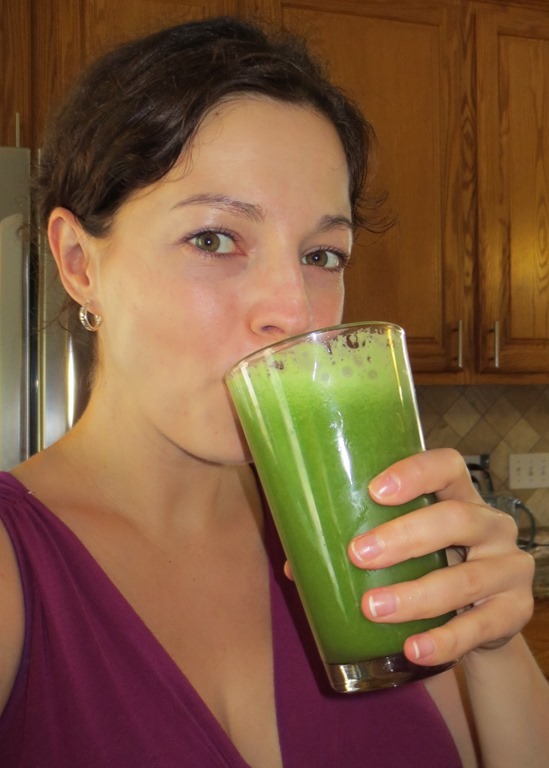 Before turning the juicer on, I stuff the opening with Kale leaves. This way prevents the centrifugal force from blowing the smaller leaves out. 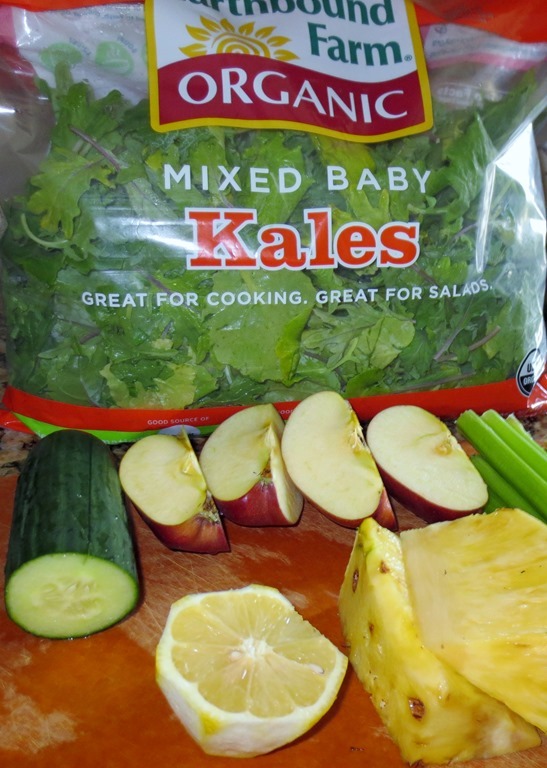 I follow with pineapple to help push the dry Kale leaves through the juicer. 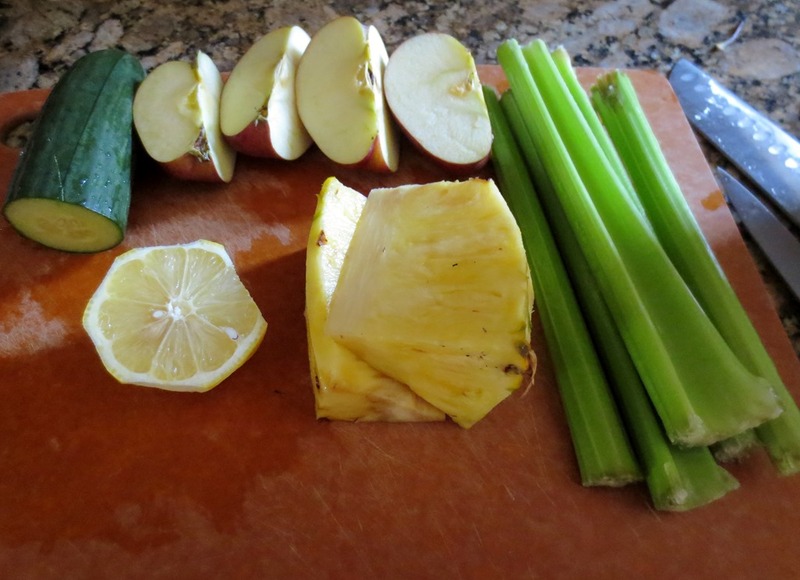 I then add celery, cucumber, apple and finally lemon. To absorb the most vitamins and nutrients, it is recommended to drink the juice right away, preferably in the morning for an energy boost. I like my juice after a morning workout. It’s a great source of electrolytes to help refuel your body. [Jane Asks]: Do you make fresh juice, or as the juice kids say, Do you juice? I’m a smoothie queen, but haven’t ventured into the green juice world quite yet. I really want to though. I’m just so afraid of tossing in ingredients and it ending up a huge waste because the result is nasty green sludge. Haha. I will overcome that though, some day!